Download the RFP Announcement (Updated December 19 2018). Our mission is to increase the access to and the use of information for biodiversity conservation and sustainable development in sub-Saharan Africa. Since 2007, the foundation has invested more than $18M in biodiversity informatics projects to: (1) collect and enhance data, (2) aggregate, synthesize, and publish data, (3) make data more widely available to potential end users, and (4) gain insights from biodiversity data to inform biodiversity conservation. The JRS strategy is to connect data to knowledge use in domains of conservation and sustainable development where the demand for information can sustain investment in biodiversity informatics. This call for proposals supports our grantmaking programs in Freshwater Biodiversity and Resources and in Pollinator Biodiversity and Services. The J.R.S. Biodiversity Foundation focuses our grantmaking in Botswana, Kenya, Malawi, Rwanda, South Africa, Tanzania, and Uganda. We may make exceptions to this policy for projects with the potential for exceptional impact upon biodiversity informatics capacity development, highly transferrable models or technologies, or close partnerships of data providers and data users. We encourage you to contact us if you have any questions regarding the degree to which your project fits this RFP scope. Inquiries or short concept notes are welcomed by email or via our online forms. We will prefer projects that can grow to a larger scale or can be transferred across geographic regions or organizational and institutional contexts. Projects that hold potential to engage with, reinforce, or benefit our current projects will be preferred. Applications that demonstrate strong demand for data and ties to decision-making will be most competitive for JRS funding. All projects must conform to the foundation’s Open Data Policy. U.S. law prohibits our financing of projects to influence legislation through advocacy or lobbying (see JRS Grantmaking). The following requirements will ensure that your proposal aligns with JRS strategy and will be considered for funding and act as an eligibility checklist. The biodiversity information system is at the center of the project, and there is a clear potential use of and future value to the data or tool. The end-users of the biodiversity information are clear, and they are directly involved in proposal development and project implementation. There are specific descriptions of hardware, software, data standards, and related technical tools, and their choice is justified. All primary data generated by the project will be available per the Open Access Data Policy and its terms for license, timeliness, standards, access, and compliance. The grant applicants are African or that African professionals and African institutions play significant and long-term roles in project design, implementation, and sustainability, and as recipients of funds for projects that originate outside of Africa. Training and capacity development are explicit aims of the project through long-term engagement with trainees, network building, and sharing of training resources. Outputs and outcomes have specific targets that are measurable and time-bound. Plans for outreach include efforts to secure future partners and funders. Budgets are justified in significant detail regarding cost assumptions, timing, and rationale. Types of Proposals: The total multi-year requested grant may range from about $50,000 to about $250,000. JRS will accept three types of proposals: 1) proposals for multi-year projects, 2) proposals for planning grants for multi-year projects, and 3) proposals for JRS co-funding of biodiversity information components of existing projects. Application Process: All proposals that comply with the application guidelines will be considered. All proposals must be submitted using the online system. Proposals will not be accepted after February 28, 2019. Thursday, December 20: Grant application portal opens. Thursday, February 28: Deadline for submission of proposals. Thursday, April 25: Invitation to semi-finalists to revise proposals. Tuesday, May 7: Deadline for submission of revised proposals. Tuesday, June 4: Final funding decision communicated by the Foundation. Wednesday, August 1: Approximate date of first payment to approved grantees. This is an estimate only and is subject to change. JRS awards for multi-year implementation projects have ranged from $70,000 to $350,000 and averaged $180,000. Freshwater ecosystems are under threat from expanding agriculture, human settlement, extractive industries, and from climate change. The biodiversity of freshwater ecosystems is critical for ecosystem services for human well-being and livelihoods. Please see our program description at Freshwater Biodiversity and Resources. JRS seeks projects that increase the access to and use of biodiversity information relating to freshwater biodiversity assessment and the conservation of freshwater ecosystem services in Uganda, Tanzania Kenya, Rwanda, Botswana, Malawi, and South Africa. All proposals must comply with the General Qualifications described in this announcement, particularly that the information system is at the center of the project’s aims, information users are directly involved, and all data is Open Access. Problem Scope: Successful proposals will address challenges that face freshwater biodiversity conservation and sustainable development. Problems (focusing on the biodiversity component) may include but are not limited to (1) assessment of species and ecosystem conservation status, (2) designation or improved management of protected areas, (3) management of fisheries, (4) siting of water and other infrastructure, (5) mitigating impacts of energy and extractive industry development, (6) protection of watersheds for freshwater supply, (7) mobilization of data for and from environmental impact assessments, and (8) trans-boundary management of catchment basins. Meeting Demand for Knowledge: Approaches to ensure the value and use of data to address the problems above may include but are not limited to: partnerships that include data providers and users, data use for the development and implementation of national policies or international agreements, data use for conservation planning and management, and partnerships to mobilize environmental impact assessment data. Users may be in the public, private, and not-for-profit sectors in roles that involve decision-making that influences biodiversity. Technical Scope: Successful proposals will increase the access to biodiversity data of freshwater systems that is valuable to near-term decision-making for conservation and sustainable development. Technical approaches may include but are not limited to mobilizing and enhancing: existing data; new or improved information platforms and services; technologies for data collection and publishing; mobile phone based technologies, and data visualization tools and platforms. Out of Scope: Out of the scope of this call are projects in marine ecosystems, projects focused upon species that do not have critical life stages that are dependent upon freshwater ecosystems, projects that primarily aim at taxonomy or museum collection digitization, projects for livelihood development and ecosystem restoration, and projects without specific end-users and partners. Projects that focus on conservation, basic research, and ecological monitoring without the development of an informatics component are also out of scope. All applicants are encouraged to use the “In-Process Review” function in our online system or to write directly to us to check whether your project ideas are in scope and to receive constructive input. Please review the awarded grants in our Freshwater Program to understand our funding interests. Pollination is one of the most important ecosystem services supporting human life and livelihoods as well as natural biodiversity and primary productivity. Please see Pollinators Biodiversity and Services. JRS seeks projects that increase the access to and use of biodiversity information relating to pollinator biodiversity assessment and the conservation of pollinator services in Uganda, Tanzania Kenya, Rwanda, Botswana, Malawi, and SouthAfrica. Problem Scope: Successful proposals will address challenges facing pollinator conservation in Uganda, Tanzania Kenya, Rwanda, Botswana, Malawi, and South Africa. Challenges to creating access to pollinators data are many and include inadequate expertise, insufficient data on pollinator status and on pollinator-plant interactions, few options to mitigate risks to pollinators, lack of standard field methods and data standards, and lack of economic evaluations of pollinator services. Monitoring the impacts of agricultural productivity strategies. Methods: (1) Approaches for large scale/low-cost pollinator data collection; (2) Methods for pollinator identification; and (3) Methodology, standards, and database design for plant-pollinator data. Platforms: (1) Develop transferrable database and website models; (2) Develop pollinator knowledge platforms; and (3) Online access to field guides and checklists. Capacity Development: (1) Biodiversity informatics expertise; (2) Baseline datasets; (3) High-quality pollinator biodiversity data components of agricultural studies; and (4) Network formation and capacity building. Out of Scope: Out of the scope are projects to develop new agricultural practices, livelihood projects, community development projects, beekeeping projects, projects that are aimed solely at taxonomic revision and determination, behavioral research, and mass digitization of museum collections. IDRC and South Africa’s National Research Foundation (NRF) are pleased to announce a new research chairs initiative that is set to transform the African research landscape. The OR Tambo Africa Research Chairs Initiative, named after Oliver Reginald Tambo, the pre-eminent South African leader and advocate of science and technology, will support up to 10 top researchers from across Africa over the next five years. This call is open to African public research-intensive universities. If you no longer wish to receive funding alerts, you can always unsubscribe. 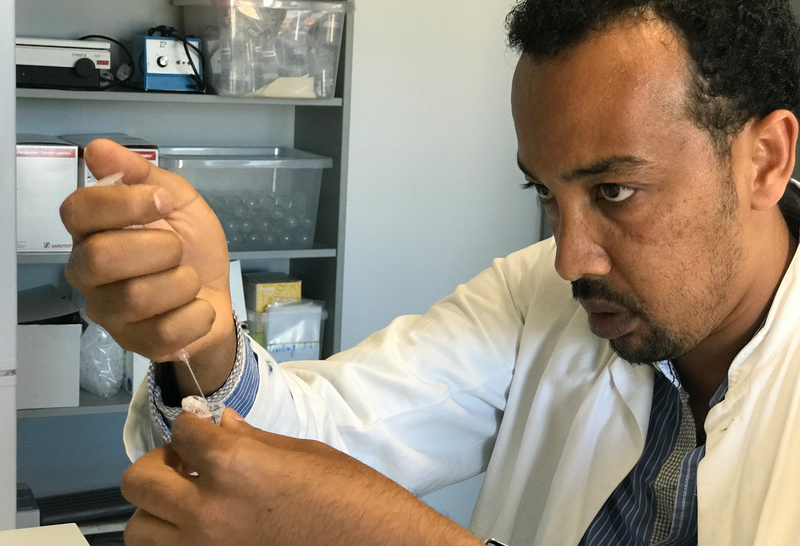 Yonas Hailu Alemu, Assistant Professor, Haramaya University in Ethiopia, completed his PhD study in 2017 as part of the University of Copenhagen’s Haramaya Camel Dairy Project. Two calls for applications 2019 (Phase 1) for research collaboration projects are now open at the Danida Fellowship Centre website. - Growth and transition countries (Window 2). Applications are open to research-based institutions in Denmark. The deadline for the submission of the electronic Phase 1 applications for both calls is 1 February 2019, 12:00 noon Danish time. Danida Fellowship Centre has administered the Ministry of Foreign Affairs of Denmark’s support to research projects in Danida partner countries since 2008. We administer the two phased annual application rounds for the competitive funds. Phase 1 is the first step of a process in which applicants submit their project ideas, while Phase 2 is the submission of a full application by those prequalified in Phase 1.